The diagram shows an estimate on, how we covered these 5 strategic themes in 2016. Most of our activities cover though more than a single theme, and the diagram does therefore not provide a total spread of our activities. 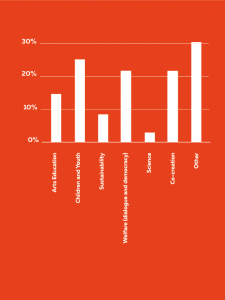 In just about 70% of DCI’s activities cover cultural projects with a crossover effect on societal issues and has a cross-pollinating effect. The remaining 30% of our activities embrace helping Danish artists to get to act internationally, creative highly qualified artistic co-operations, consulting, lectures, network and media collaboration etc.